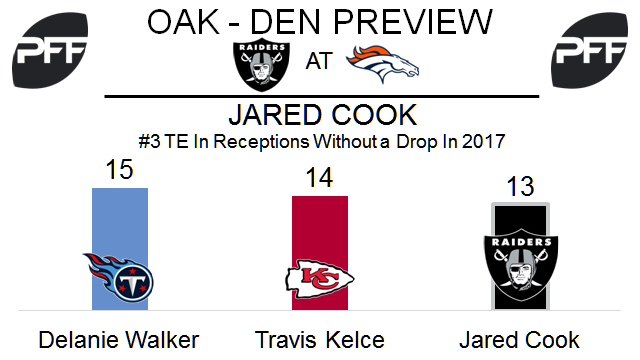 TE Jared Cook vs. S Darian Stewart – The strength of the Broncos secondary is at cornerback, so this is a matchup the Raiders must take advantage of. Cook has 13 receptions and no dropped passes this season, the third most of any tight end without a drop. His 1.61 yards per route run is 11th of 38 tight ends that have run a minimum of 40 snaps in route this year. Stewart is ranked 33rd of 80 qualifying safeties this season with a 76.2 PFF grade. Last year in the two games against Oakland he was only targeted twice, and allowed one reception for eight yards in 65 coverage snaps. T Marshall Newhouse vs. EDGE Von Miller – Newhouse got off to a good start in Oakland, as he did not allow a pressure in his first two games. He struggled in Week 3 against Washington, and now will face his biggest test in Week 4. Of the 70 offensive tackles that have logged 40-plus pass-blocking snaps this year, Newhouse is 18th in PFF pass-blocking efficiency (pressure allowed per-snap with weighting toward sacks). Miller is PFF’s second-ranked edge defender this year with a 91.1 grade, and is sixth in pass-rushing productivity. He harassed Raiders quarterbacks last year with one sack and nine total pressures in two games. 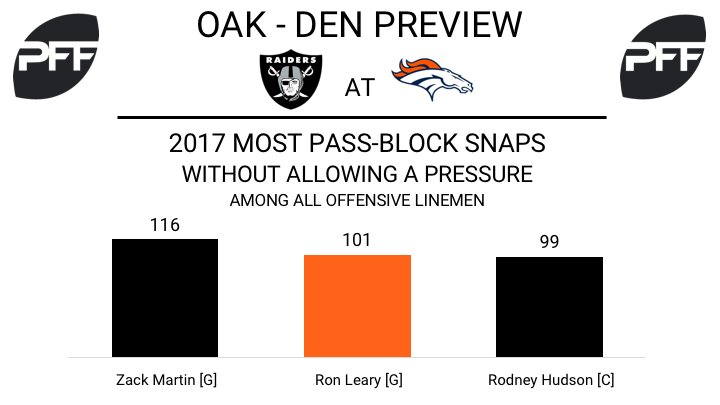 HB Marshawn Lynch vs. LB Brandon Marshall – The Raiders will look to re-establish their running game against Denver with Lynch leading the way. His 2.97 yards after contact per attempt is seventh best of all running backs with 30-plus touches this season. Lynch has not been heavily involved in the passing game, with only three catches for 28 yards on five targets. Marshall is off to a slow start this year after being ranked in PFF’s top 16 linebackers each of the last three seasons. His 2017 grade of 46.6 is 55th of 86 qualifying linebackers. He has struggled in coverage, allowing receptions on all 13 of his targets for 117 yards. G Ron Leary vs. DI Eddie Vanderdoes – Leary enters Week 4 as one of two guards with at least 40 pass-block snaps to not allow a single pressure. Vanderdoes has looked good rushing the passer this year, earning the 21st best pass-rush grade among interior defenders (77.3). He’ll look to get after QB Trevor Siemian this week after failing to record a pressure last week. HB C.J. Anderson vs. LB Cory James – PFF’s No. 3 graded running back looks to have a favorable matchup over James, whose overall grade of 68.4 ranks 42nd among linebackers. While he struggles in coverage, James has fared significantly better in run defense, earning a run defense grade of 79.2 (tied for 16th among linebackers). Anderson has proven tough to tackle this season, forcing 10 missed tackles on rush attempts, tied for fifth most. TE Virgil Green vs. S Karl Joseph – Green has been efficient as a receiver this season, grading as the 13th best receiving tight end (73.9 grade). He’s averaging 1.83 yards per route run, tied for eighth highest among tight ends with at least seven targets. Joseph is currently PFF’s seventh-highest graded safety, though his coverage grade of 74.2 only ranks tied for 34th. He has allowed five of eight targets to be caught for 55 yards on the year.